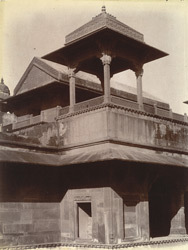 Photograph of the Jodh Bai Palace at Fatehpur Sikri, taken by Edmund William Smith in 1893, from the Archaeological Survey of India Collections. This is view of a chhatri, or kiosk, above the reception room of the Jodh Bai Palace, at Fatehpur Sikri, the Mughal Emperor Akbar's palace-city complex, built between 1571 and 1585. The palace was part of the Haram Sara (Imperial Harem), which comprised a large number of buildings and apartments for the ladies of the court. The Jodh Bai Palace was the largest of these buildings with a central courtyard and a symmetrical four-iwan plan. Above the upper rooms in the north and south wings, are ribbed roofs covered with bright blue-glazed tiles.